You can't top this! 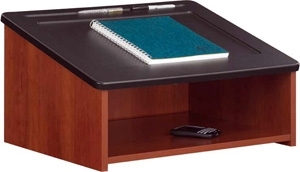 Use Lectern Top alone on a table surface or in combination with the Lectern/Media Cart Base to form a 45"H mobile lectern with storage. The speaker platform has a 21"W x 18"D recessed area to hold papers in place and a pencil groove for writing utensils.